Tolifo PT-176S LED Video light panels are superior tools for studio lighting,press interview,micro film,video recording and photigraphy. With it's lightweight and durable construction, you can carry this led light panel around with you wherever you go. A battery included!!! 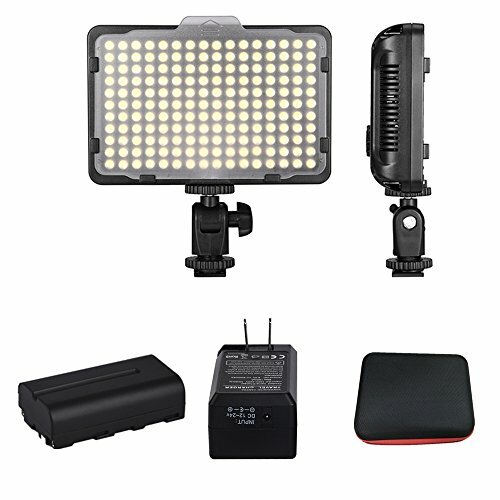 176 Led Soft Video lighting support Canon,Nikon,Pentax,Panasonic,Sony,Samsung,Olympus and other digital DSLR cameras and DV Camcorder. PT-176S LED camera light fits various professional shooting occasions, like baby photography/wedding records/journalistic/conference photography and product shooting (eg: shoes, food, clothing, cosmetics) provides wider lighting range and brighter effect. Touch Switch Design:you can not only touch the pad to turn on / off your light but also touch to adjust the brightness(10%-100%) and color temperature(3200-5600K) adjustment,comes with warm orange filter (3200K) as well as daylight white filter (5600K) of the two filters.You can use filter enhance skin tone in portrait photography,Perfect for making YouTube videos. Super thin and small size,effective Irradiation range up to 15 meters, shooting light can be easily installed with ¼- thread screwed on the light stand/tripod.